BlizzCon Cancelled This Year Due to "Jam Packed Schedule"
Blizzard has a lot on its plate for the next year. ' StarCraft II: Heart of the Swarm' is under development, the 'Warcraft' expansion 'Mists of Pandaria' is in the works and the long-awaited ' Diablo III' will be released. Add to that the rumored console version of 'Diablo III' and whatever the Blizzard's mystery project is as you've got what the Blizzard blog calls a "jam-packed schedule." In place of BlizzCon, Blizzard has announced the Battle.net World Championship, which will feature the best of the best players in 'StarCraft II' and 'World of Warcraft.' It's a nice way to plug eSports, but an event that happens in Asia isn't exactly going to make up for the US based fan celebration. With no BlizzCon 2012 to announce products through, this may simply mean that Blizzard has nothing exciting and new to reveal this year. 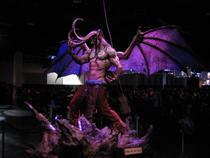 It will certainly make BlizzCon 2013 a much more hotly anticipated event.